As it curves west towards Tain on its route north, the A9 misses a long tongue of land, the Tarbat Peninsula. This reaches out in a north easterly direction into the North Sea, dividing the Dornoch and Moray Firths. 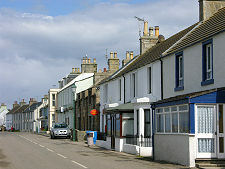 Most visitors to the area sooner or later arrive at the pretty seaside village of Portmahomack. This has an idyllic location. It comes complete with distant views of the Sutherland hills beyond the barely visible line of settlements along the coast, including Dornoch, Golspie and Brora on the far side of the Firth. And those with particularly good eyesight can just about pick out the large light-coloured mass of Dunrobin Castle. Portmahomack's origins date back to the arrival here of St Colmac, who established a priory in AD975. The village grew between it and the shore, taking advantage of the shelter of a location on the west side of Tarbat Ness. A church was built on the site of the priory in 1255. 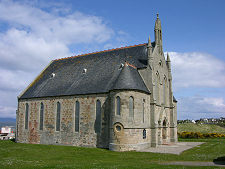 This was replaced in 1756 by what is now known as the Old Tarbat Parish Church, which today houses the Tarbat Discovery Centre. This is designed to provide visitors with an insight into the area's pictish past: complete with a life-size bronze of a Pictish Queen outside. 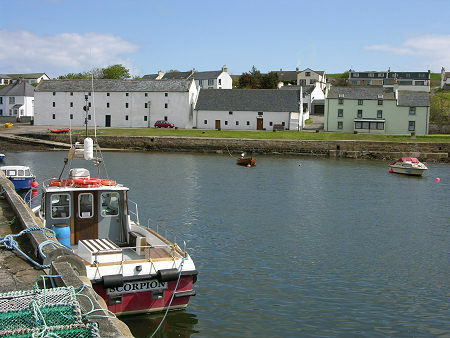 Portmahomack grew as a fishing village which at its peak in the 1830s was home to over 100 fishing boats supporting a large onshore fish curing industry. Today its picture-postcard harbour remains home to a number of small fishing boats. But it is also popular with leisure craft and has become a pleasant resort complete with a broad sandy bay edged at low water with rock pools. The village itself climbs a slight hill behind the bay, and on a sunny afternoon the whites and greens of the harbourside buildings combine with the beautiful blue of the sea to give an impression that could have come from Cornwall or, with a little stretch of the imagination, the South of France. Portmahomack also boasts two hotels, a shop and a post office, and while it can't compete for facilities with Tain, ten miles or so to the west, it has everything you might want on a quiet day out. 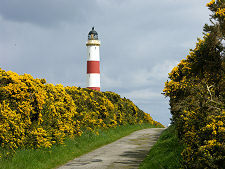 Following the road past the Discovery Centre for three miles brings you to the tip of the peninsula, and Tarbat Ness, home to what is at 40m high one of the tallest lighthouses in Britain. This was built to prevent seafarers heading for the Dornoch or Moray Firths impaling themselves instead on the rocks of the Ness. The Tarbat Peninsula is unlike much of the rest of Scotland and can be a beautiful and entrancing place. So when you see the signpost off the A9 to Portmahomack, think seriously about making the detour and spending some time exploring the area.